Still dreaming after all these years. 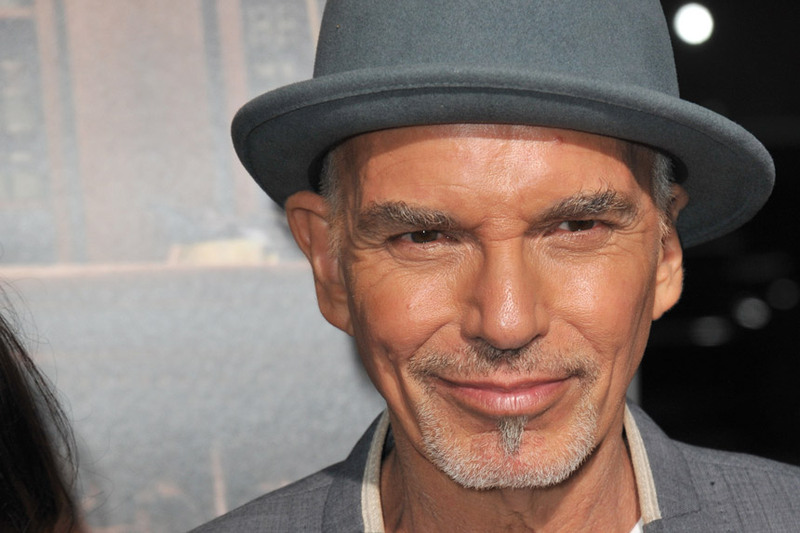 Don’t try to define Billy Bob Thornton by the characters he chooses. The way he sees the world is always more or less than you expect. He hasn’t lost that aura of being a down-home Arkansas country boy to the bone, but he’s also an award-winning actor, filmmaker, poet, and musician. He’s been married six times, yet he remains a total romantic, and yes, he’s still friends with Angelina Jolie, his most famous ex. Thornton can be impatient with fame, but he admits he’s a sucker for any fan who wants a selfie or a word of advice because he genuinely cares about them. When people stop him, it’s to talk about Sling Blade or to have another laugh at Bad Santa or remember Monster’s Ball. Lately, TV has brought him new attention, new fans, and critical praise. His portrayal of vicious contract killer Lorne Malvo on Fargo won him a Golden Globe. I was backstage earlier this year when Thornton won his second Golden Globe for Goliath, now in its second season on Amazon. He puts an original spin on Billy McBride, a brilliant and boozy lawyer who goes it alone after leaving the corporate world behind to live life his way, and he loves it. Maybe that’s because Billy Bob seems to be doing the same. Jeanne Wolfe: Your co-stars and the crew on Goliath say that they don’t know what to expect from you. Your acting is magic. It looks like you’re doing nothing, but whatever you do is so impactful. Can you explain that? Billy Bob Thornton: It’s like you’ve got a recipe to make a cake, and it says to put in half a stick of butter and two cups of sugar. My grandmother and my mother both make the best German chocolate cake. They never followed any kind of cookbook. They’d put in two or three sticks of butter, extra sugar, whatever they felt would make it the best. That’s the way I approach acting. I try to do what I feel like in the moment. I know that’s a cliché, but I really believe that. If it says in a Goliath script, “Billy breaks down in tears,” I probably won’t if I don’t feel like it. But there may be another scene where I’m talking about almost anything, and I may break down in tears because I feel it. That’s where I’m coming from. I do think there’s some of me in Billy McBride, especially his sense of justice for the little guy. My wife sees some of him in the way I argue. We’re like the Honeymooners. My wife goes, “Ralph, shut up!” She says the horrible part is that I become a lawyer, sort of like Billy. I go, “Hang on! You just said this but three minutes ago you said that. You’ve contradicted yourself. Which is the truth?’ It drives her crazy, but we usually end up laughing. Jeanne Wolf with Billy Bob Thornton. JW: You grew up with a tough father. At a young age, you set out to break free and express yourself. BBT: What’s shocking when your own father isn’t so nice to you, why it was so scary, is because you thought parents were supposed to be different, but they weren’t. I’ve had my share of demons; most of mine are related to family stuff. I also grew up in the heyday of rock ’n’ roll, and I was in a band, so I saw how to be wild pretty early. But I’ve never stropped dreaming. I think when you do that, you die as an artist, so I’ve got big dreams still. I try to act like I’m 19 every day and I’m still looking for my career. I’m still trying to make it with my band. The Boxmasters have been together 12 years. We still feel like kids trying to make it because we’re not a hugely popular band. We have our naysayers who fuss because I’m an actor. So we’re still trying to make it as a band, and that’s okay by me because we keep dreaming. JW: When someone asked what the best part of winning for Goliath was, you said it was having your wife, Connie Angland, there to share it with you. There’s a feeling that if you’re going to be famous and live a complicated life, whom you go home to makes all the difference. BBT: My kids and my wife — at the end of the day, those are the people you live with, and those are the people you love more than you love yourself. When I look at my kids, I want so much more for them than I had. The band released a new album in July called In Stereo. I wrote songs for my wife and my daughter on it, and also one for both of my sons. The song I wrote for my sons is called “Rise Above Me,” which means you don’t have to follow in my footsteps. You don’t have to make the same mistakes. You don’t have to try to be me. You don’t have to try to be famous. You can go further than I went. You can be better than I was. That’s what you want for your kids. Believe me, they mess up — especially my sons. I guess what I’m saying to them is that you can find your own way and I’ll help you as much as I can. JW: You’re not only getting bad guys in Goliath, you’re getting romantic. Are those scenes fun or awkward? BBT: Well, when you’ve been around as long as I have, you get used to love scenes or being around beautiful women, and you don’t get much more beautiful than my co-star Ana [de la Reguera]. She’s really striking. To tell you the truth, she told me that she was really nervous to work with me because she had been a fan, but I said that I was kind of nervous to work with her because, you know, she’s blindingly attractive. But she’s such a regular person. She’s goofy. She goofs off with me so much that we have become really good pals. I think it gets harder then. JW: You’re often thought of as portraying guys who are uncivil or even evil. Is that how you see it? BBT: Well, I think, at the end of the day, the character in Fargo is probably the only one I’ve ever played who was really a bad guy — next to the character in One False Move, which was a long time ago. But outside of those two characters, I’ve never played anyone who was actually heartless, which is sometimes maybe the reason people get involved with my characters who are a little in the underbelly of society. Billy McBride has a giant heart. He really does. The character in Fargo didn’t, but I think the reason people liked that character was because he had this wicked sense of humor. I think that if I played that character and there’d been no sense of humor to him then it may not have worked as well. JW: I’ve heard that you’re a sucker for fans — that you have a hard time saying no or turning down a request to snap a selfie with you. BBT: You know, I’m really codependent. I mean, I’ve talked to people on the sidewalk for a half-hour when I was late to an appointment because — well first I’m a Leo, and Leos want people to like ’em, you know? The main thing is that your fans — as long as fans are nice and they’re not rude — I’m all for them. Those are the people who put shoes on my kids, and I owe it to them. You can’t just pass somebody by and ignore them. It means something when the people give love to you because you did something they truly enjoyed, and they truly got the vibe. That feels good. I felt that way on Sling Blade on the Academy Awards. I felt people really understood it because, God knows, I’m not that much of a part of Hollywood. I don’t hang out in the social circles, so I guess I gotta do something that they like.